It was my turn to host my daughter's Bible study group last night. I finished my fall table topper over the weekend and it made for a pretty table. I was not completely happy with the way it turned out so I'm just showing you a little pumpkin corner. 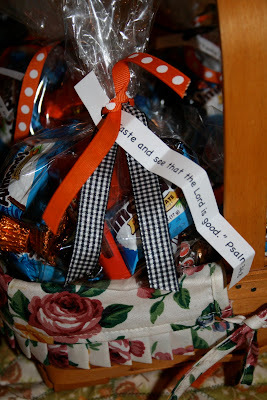 What would a fall gathering be without some take-home candy bags? Every girl needs a little chocolate now and then! I found these napkins at Hobby Lobby. What a great reminder as we start this week out together dear blogger friends! Your fall topper looks lovely and I love Hobby Lobby's Christian influence that can be seen in much of their merchandise. Very refreshing. what lovely decor for the bible study! i'm sure everyone loved it! :) have a great week! Love your tabletopper pumpkin. What a sweet hostess you are. Love those napkins and what they say. Boo...no Hobby Lobby here. We are our own worst critics. I bet your runner was adorable as the pumpkin is great! Love the napkins and the treat bags :) Blessings to you! After looking around at your blog, it seems you're a girl after my own heart. I'm adding you to my blog list so my readers can meet you, too!